Or “Serenity Now!” in your best George Costanza – I know some of you are thinking it, so I wanted to put the awkward moment behind us! 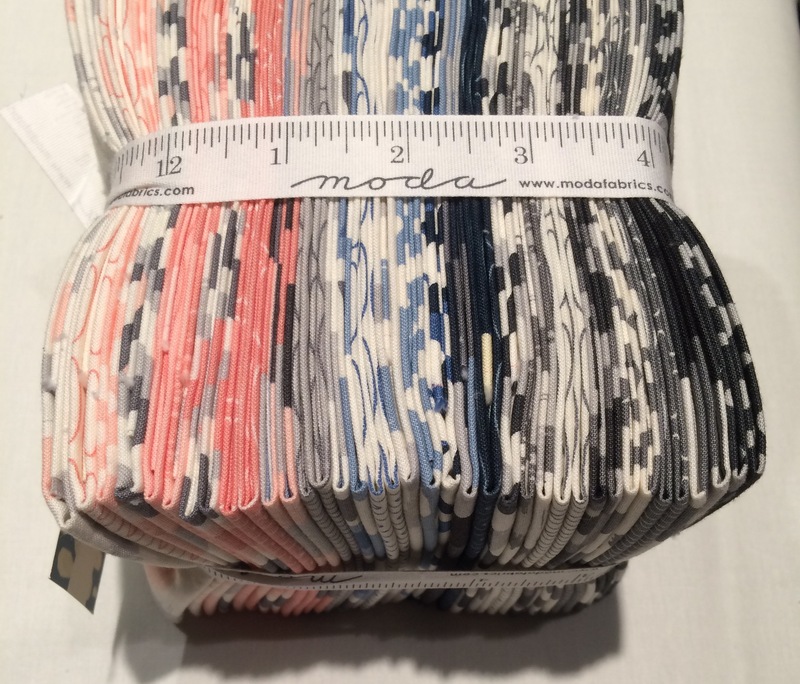 I thought I would just be introducing patterns in this post, but realized I couldn’t even share the fabrics with you until Market, thus it hasn’t happened yet. I’m really excited about Serenity, the palette is soft and neutral, and just really pretty. I know I’m biased, but I hope you’ll agree! I know some of you are probably a bit surprised with the inclusion of pink in this group! It’s a soft, creamy pink that kept showing up in home decor trends as I was searching for inspiration for the group. I haven’t always been a fan of pink…in fact, it wasn’t until I had little girls of my own that the color grew on me, a lot. Before then I avoided it, at any cost! 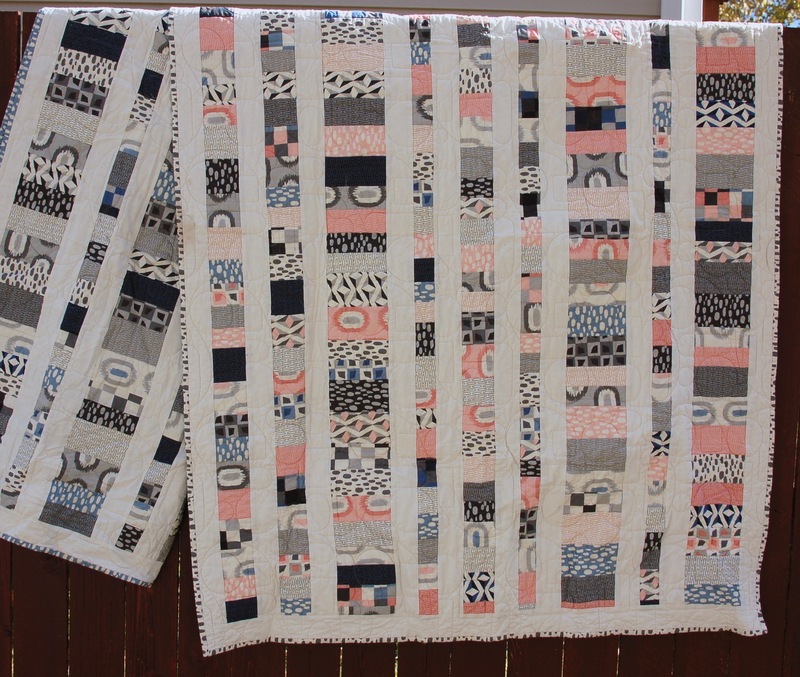 If you look through my quilts, there’s plenty of pink, clearly it’s not a problem for me anymore. The blues and grey are so nice together, soothing and relaxed. 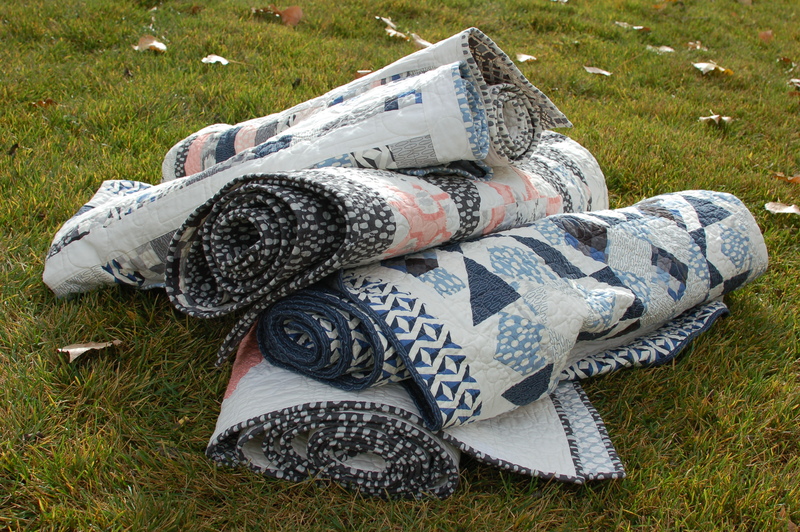 Serenity is shipping in April 2016, ask your local quilt shop about the collection now! 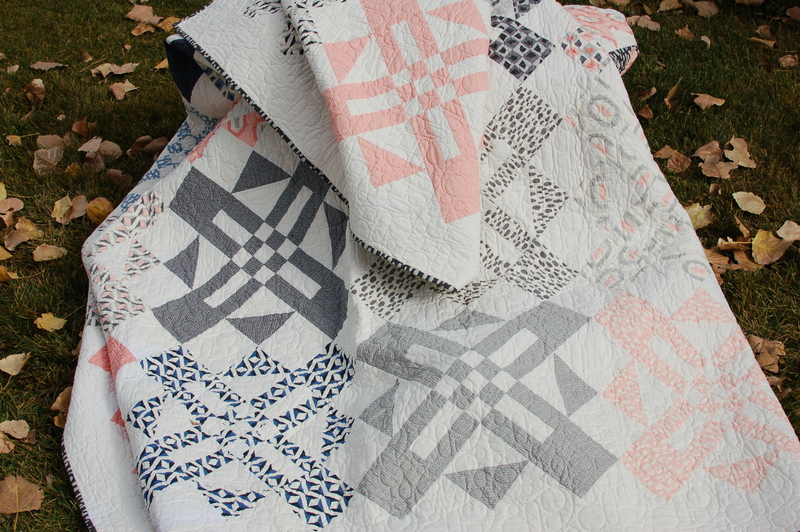 Truth: I had this quilt in my collection, waiting for the perfect place to use it, and I was so excited about how pretty the quilt turned out! 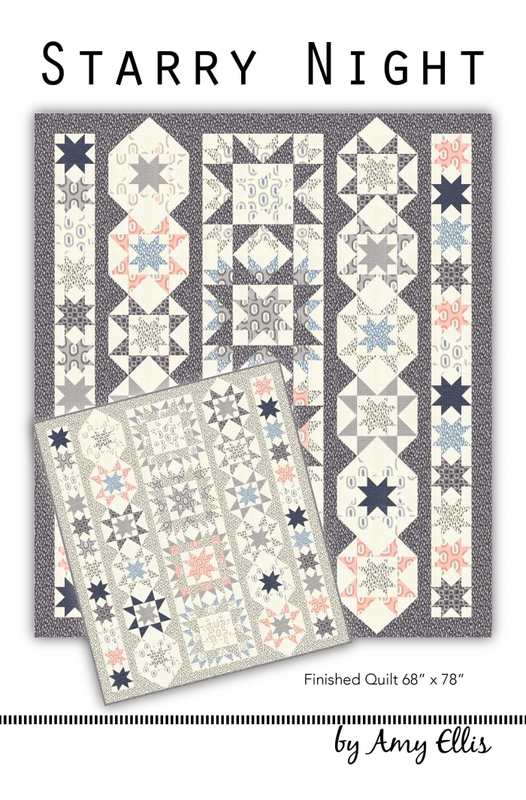 Included in Starry Night, is a 12 page booklet with instructions for each of the three star blocks featured in the quilt. 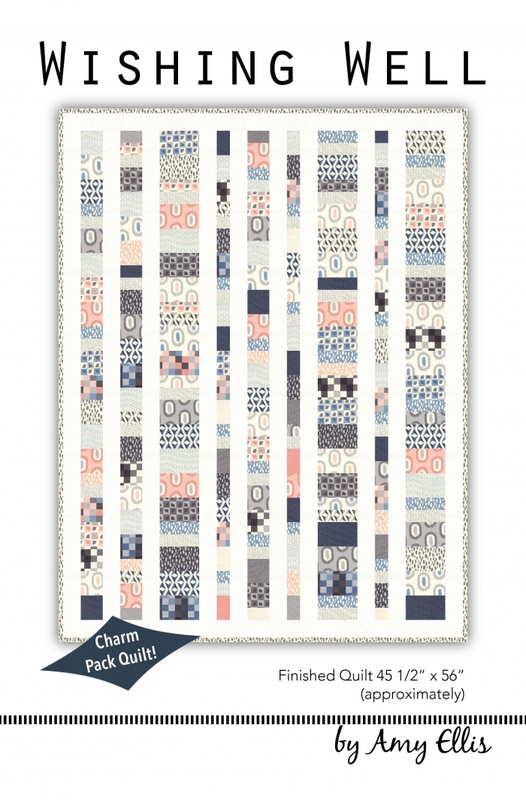 Starry Night measures 68″ x 78″ for a generous throw quilt. To make Starry Night you’ll need, ten half yard of fabric, along with the solid (9900-281 eggshell), and border/binding print. 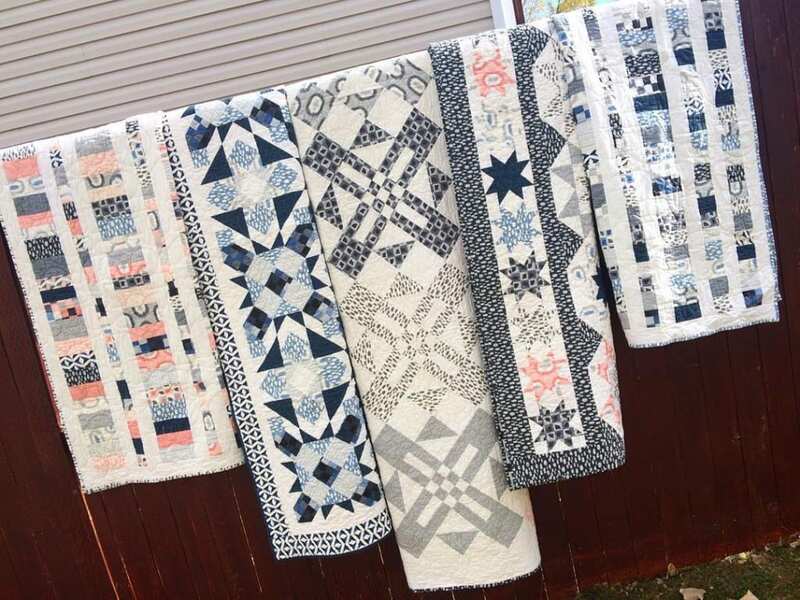 I pieced and quilted all the quilts in the two weeks prior to Market, and was super thankful for my Baby Lock machines. They kept up with all the late nights better than I did! 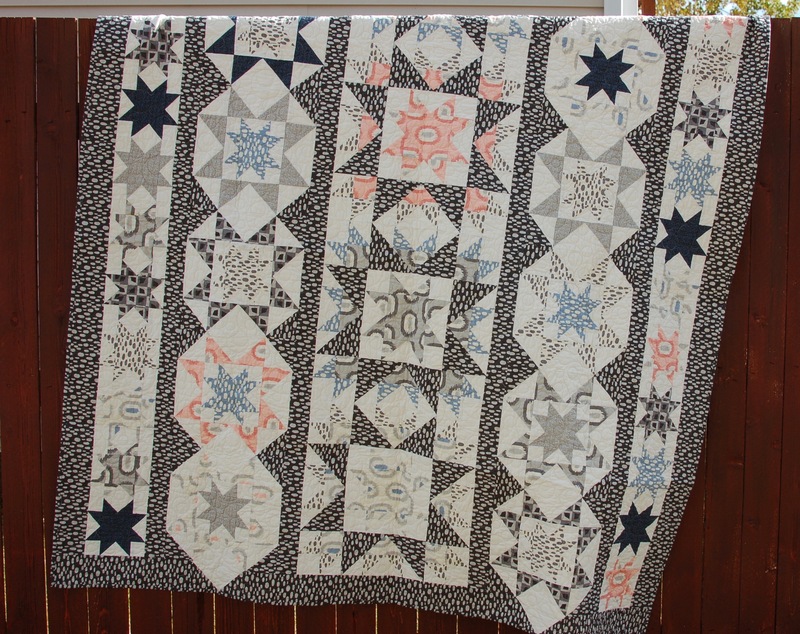 I quilted (my pro-stitcher quilted!) 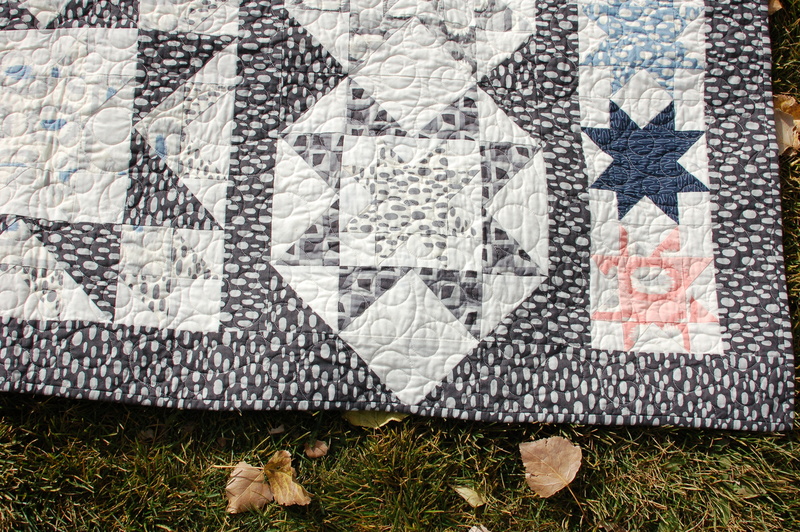 Starry Night with an all over circle design to add some softness to all the sharp points in the stars. 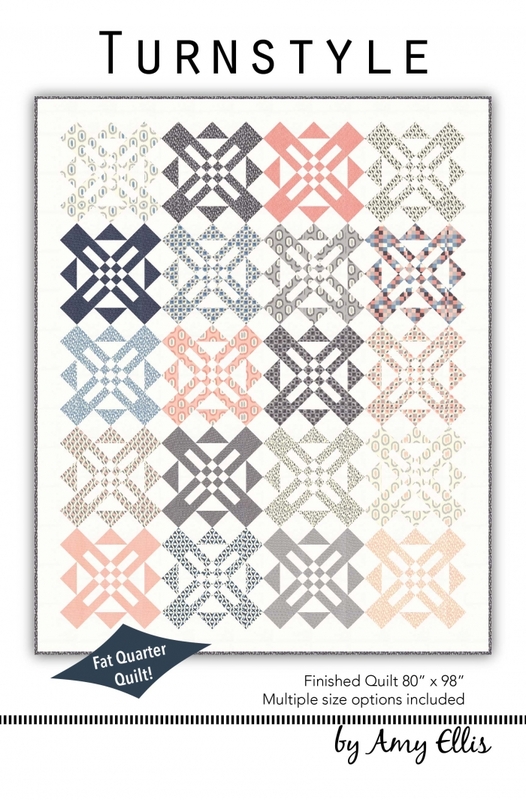 Next is Turnstyle – A fun fat quarter quilt, with large blocks for a fast finish! When I’m sewing late at night to meet a deadline, I usually pause at some point to ask myself why I design such large quilts!? 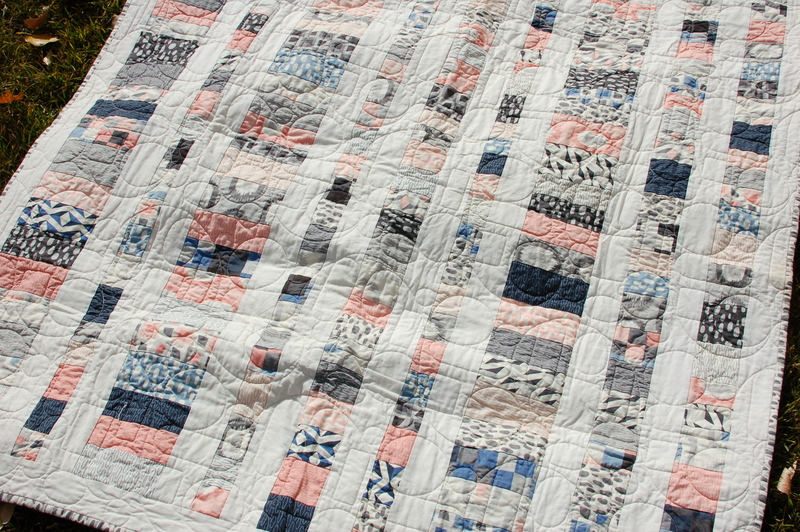 I know it’s because I like to make them usable, but there are moments when a smaller quilt would be ideal! 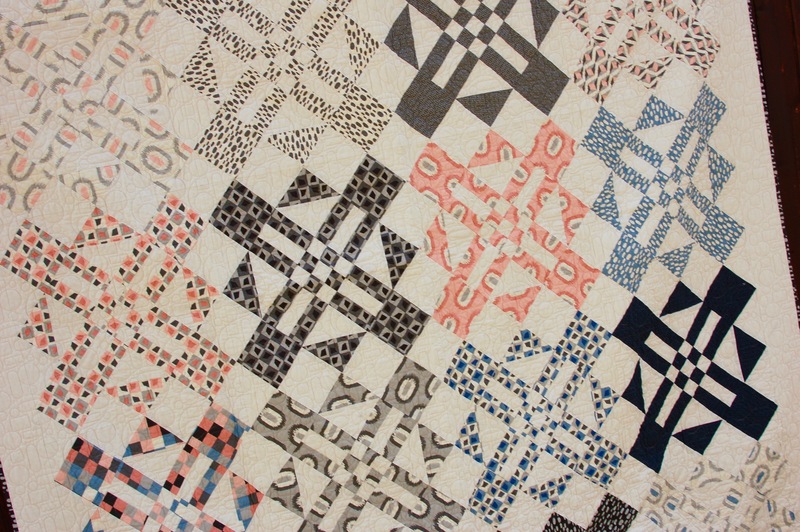 To make Turnstyle you will need a fat quarter for each block you wish to make, and the solid. Included in the pattern is a throw (9 blocks), full (20 blocks) and king (25 blocks), with cutting instructions spelled out for each! Turnstyle was quilted with a circle and oval all over pattern, that is just dense enough to still be comfy to snuggle under. 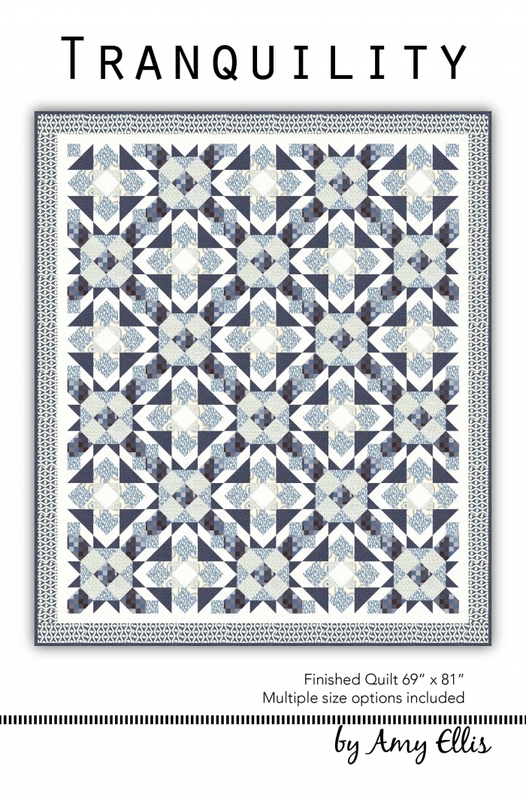 Tranquility highlights the blue and grey prints in the collection. This is designed with two traditional blocks alternating. With careful color placement, the blocks look as though they interlock with each other, even though I’ve made it, I still get caught up trying to figure it out. It’s simple. I promise! Tranquility is available in baby, twin and queen sizes. (twin shown on cover) There’s 12 pages of instruction and illustration to walk you through each step. 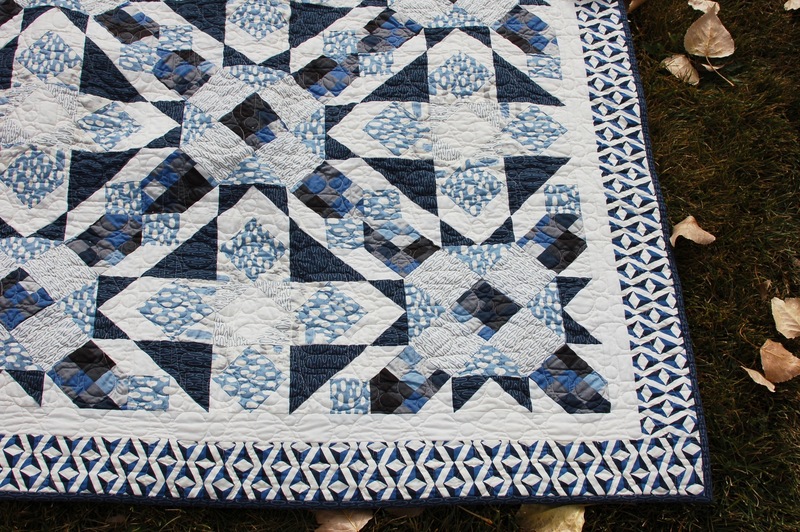 Tranquility was quilted with the same oval and circle design – the texture is great! Finally Wishing Well. Wishing Well is a baby quilt or lap quilt, if you prefer. Wishing Well requires two Serenity charm packs and a white solid for the sashing/borders. 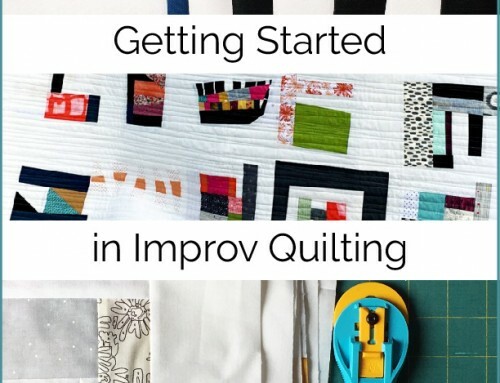 It’s honestly, a really fun quilt to make, especially if you are in a hurry! Ideal for snuggling up a baby in, whether in a stroller or on the couch, I hope it’s the quilt that’s asked for again and again. 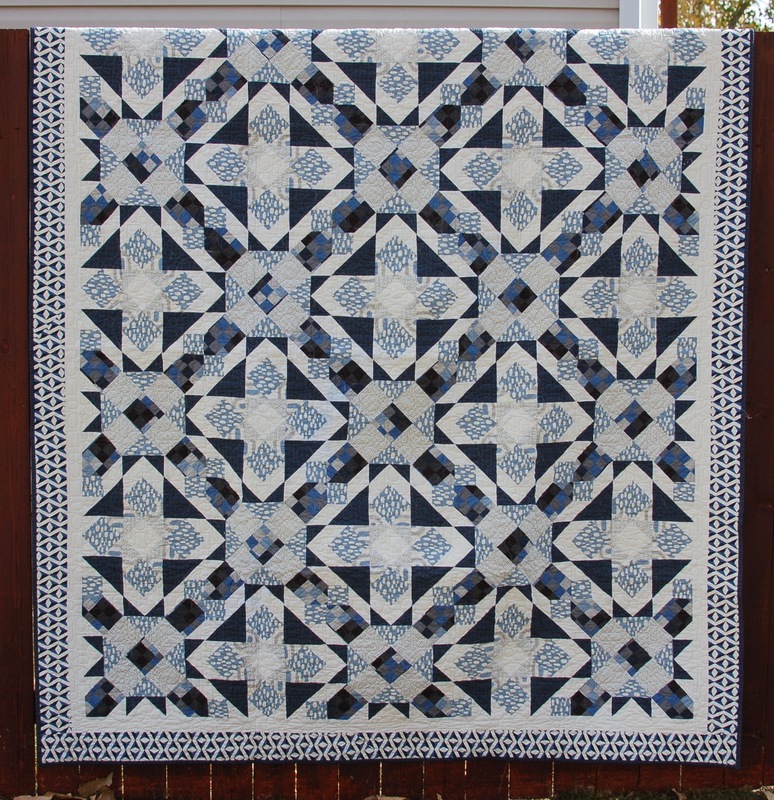 I used the same circle and oval allover quilting for Wishing Well, in a larger scale to ensure it’s cozy factor was high. And – it is! *Congratulations to those of you that made it to the end! That’s a lot of info and pictures to ingest. I hope you liked what you saw, there’s links to purchase patterns in my shop throughout the post. ALSO, you can save 20% through the weekend with coupon code “serenity“, and anyone that makes a purchase in the next five days (11/4 – 11/9/15) will be entered to win a flat rate envelope FULL of Serenity scraps! My first thought when I saw the fat quarter bundle was I didn’t like the pink. 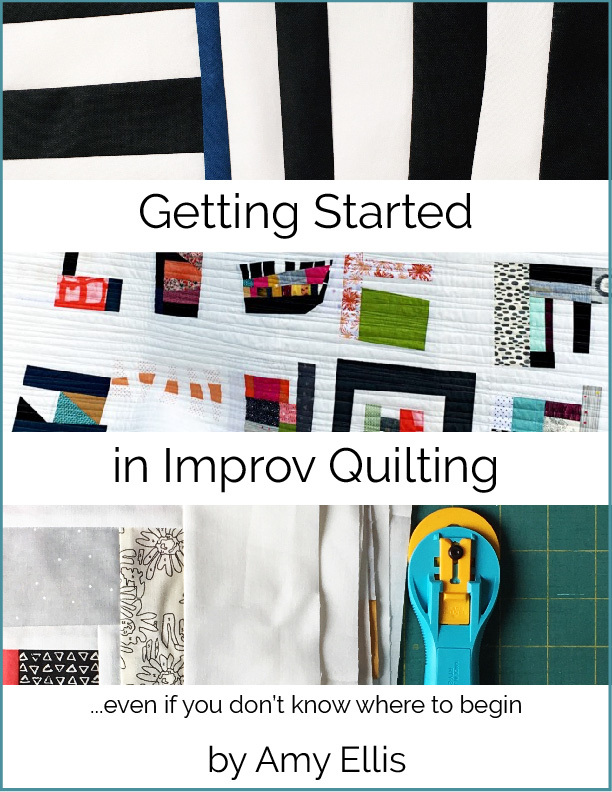 However, I changed my mind after seeing your quilt creations. They are beautiful and the pink works wonders bringing everything to life. Just beautiful! 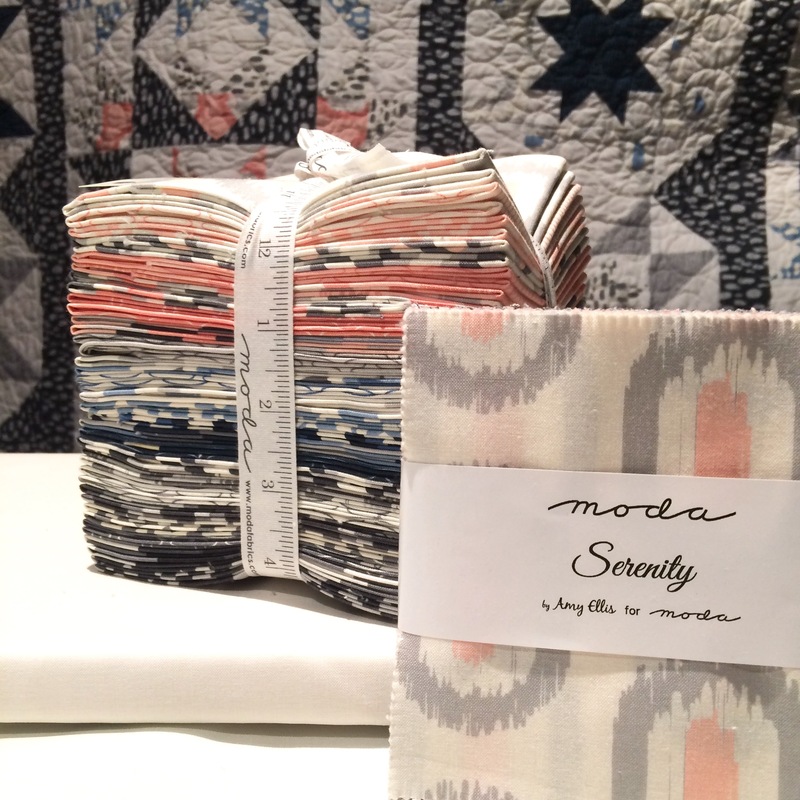 Great fabric and quilts — I especially like Tranquility. The border on that one is great too. I really like Turnstile and the pink. Could you please tell me what the co-ordinating solid you’ve used is? Ha! I had that comment couple times at Market, and thought I just better embrace the Seinfeld :) So glad the pink didn’t put you off the group, and yes, Wishing Well is perfect for a beginner! Thanks Carrie! I am designing in EQ7, occasionally paper and pencil, it really just depends on the initial concept.